So when you're as deep down the Legendary hole as we are, your biggest problems include storage, sourcing card sleeves and not being able to say no to another new Legenary release. Not that these new games are bad - we're players who enjoyed their Big Troube in Little China release after all. But there are just so many of them exploring more and more entertainment franchises. But man, when they said they were making a release based around the Firefly universe, we knew that there was no saying no to this particular game. And as much as we love these Legendary deck building games, this one was particularly shiny. 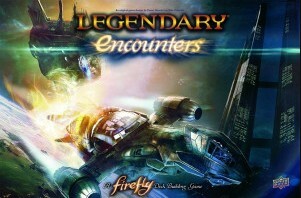 Legendary Encounters: Firefly is a deck building game created by Ben Chichoski and Daniel Mandel. This is a Legendary Encounters game, so its' not quite the same line as the Marvel deck builing game, but it is directly compatible with Aliens and Predator. The game supports 1-5 players and overall gameplay remains cooperative. The game puts players in command of the Firefly-class starship Serenity, in particular the quirky band of rogues who call her home. With 9 main charaters on the show, The game has you declaring 5 characters as your main ones (who will affect and get affected by cards in the game) supporting characters whose corresponding decks make up the cards that can be recruited during the game. In addition to the usual challenges of facing threats, players also need to manage the additional spaces that represent Serenity, and thus the ship can also take damage or give benefits in the long term. One of the main differences in this game is how the end of a three-mission "story arc" of sorts will end with a threat that cannot be avoided and ineviably acts as a time for the end of the game. Once that card reaches the combat zone, it's pretty much all over for the crew. What I Liked: One of the best things in this game is how well it captures the feel of the different episodes of the show, as limited as the original run of the show was. So instead of the individul mission chapters like in the Aliens and Predator games, but this time each mission matches a particular episode of the show. Thus one can actualy play through the entire series in sequence and things will largely make sense. The way that the cards interact with the Main characters really spices things up and one must carefully decide how the game is to be played out using the characters you have at your disposal. One also has to consider the quirks of the Talents and Flaws system that gives you great powers but also a system for reflecting the almost tragic nature of the characters of the show. What Could Have Been Better: The biggest problem of the game has to be the card art. There are some very beautiful portraits that make the characters feel almost lifelike but there are others that depict them in an unrecognizeable fashion. This would be bad with the Marvel games as it does present some very iconic characters. But in a game based on a live-action television series puts a greater burder on having more accurate depictions of characters and scenes. And a lot of cards in the set fail to do this. Then there's the limitations of the Talents and Flaws system as the pain of Flaws seems to outweigh the benefits. Making Talents so limited in potential use is a major pain point while Flaws inevitably come up in every episode. It's a fair amount of challenge, yes. But it means you're going to lose a lot of games as well. TL;DR: Legendary Encounters: Firefly is quite shiny mainly because of its gameplay and how well it captures many elements of the show. I really do wish the art was easier on the eyes but at least most of the game is still decent and thus still worth playing. Thus the game gets a good 4.5 inevitable threats coming your way out of a possible 5.